In the 1850s and 1860s, your view from here would have been of a small but busy village. Sawmill operations began at Arcola in 1847, signaling not only the start of a prosperous business but also the growth of a community. Beyond the Mower Mansion and mills, Arcola consisted of a blacksmith shop, homes for workers, a boat yard, a school, a general store, and a warehouse. Its residents included lumbermen, a merchant, a clerk, three farmers, and ten laborers, plus wives and children. At its height, the village was home to about 40 people. With the demise of logging, the residents moved to other locations. Today, Arcola sits within the boundary of a national park—the St. Croix National Scenic Riverway. 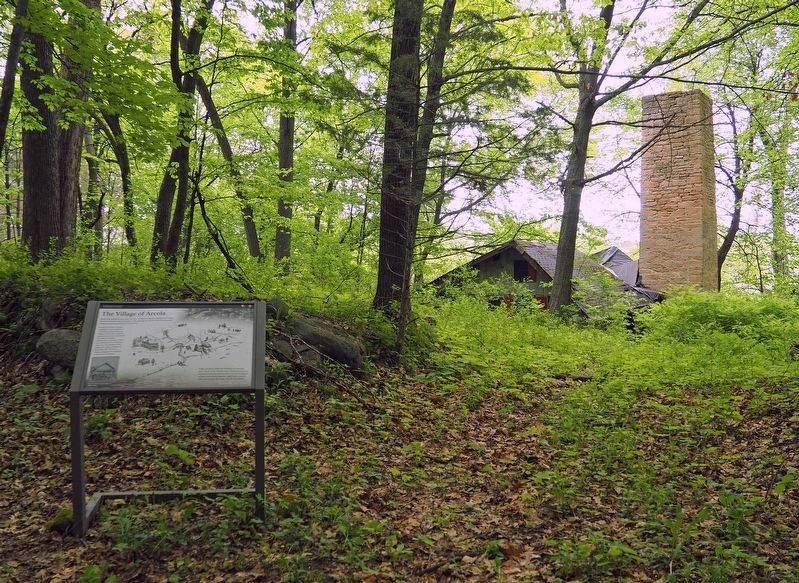 Enjoy your visit here by learning about Arcola's rich past through the exhibits in the Mower Mansion, exploring the area on trails, and taking in the beauty of the St. Croix River. Erected by St. Croix National Scenic Riverway, Arcola Mills Historic Foundation. W. Marker is in Arcola, Minnesota, in Washington County. Marker can be reached from Arcola Trail North. Touch for map. On the lower of the two trails heading north from the Mower Mansion. Public access to the site is limited to certain open house days. Marker is at or near this postal address: 12905 Arcola Trail N, Stillwater MN 55082, United States of America. Touch for directions. Other nearby markers. At least 8 other markers are within 5 miles of this marker, measured as the crow flies. River of Pine (about 400 feet away, measured in a direct line); Controlling A River Of Logs (approx. 4.1 miles away); Life at the Boom (approx. 4.1 miles away); Early Settler's Cabin (approx. 4.1 miles away); Minnesota's First Commercial Sawmill (approx. 4.1 miles away); Powerhouse and Kiln (approx. 4.1 miles away); The Pineries are Gone (approx. 4.2 miles away); Marine Mill Site (approx. 4.2 miles away). More. 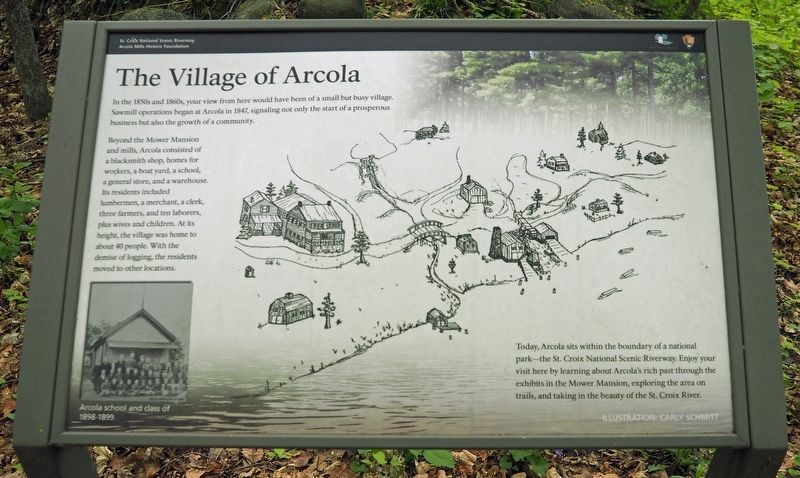 Search the internet for The Village of Arcola. Credits. This page was last revised on March 15, 2019. This page originally submitted on May 24, 2018, by McGhiever of St Paul, Minnesota. This page has been viewed 65 times since then and 19 times this year. Last updated on March 15, 2019, by McGhiever of St Paul, Minnesota. Photos: 1, 2. submitted on May 24, 2018, by McGhiever of St Paul, Minnesota. • Andrew Ruppenstein was the editor who published this page.